NEW YORK, Mar 15, 2012/ — Launching a digital beauty advisor today, Iman Cosmetics joins the crew of beauty brands who are introducing tech-savvy applications for smart phones with the new “Find Your Shade” scannable QR code. With this new app, IMAN Cosmetics, the leader in cosmetics for women with skin of color, brings the latest in technology in digital marketing, the easy-to-use code allow consumers anywhere in the world access to the “Find Your Shade” guide with one-touch of their cellular device to its customer base. “Find Your Shade” takes the guesswork out of what can be an overwhelming task for many women. 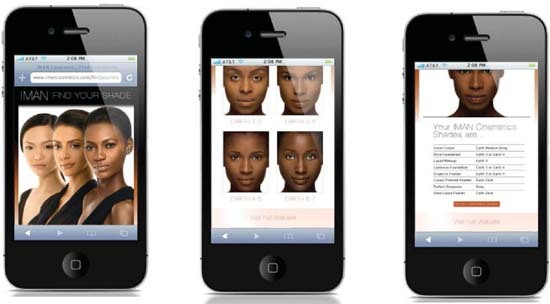 The mobile Beauty Advisor allows consumers to scan the package and immediately select their personalized shades of foundation and powder, as well as other complimentary IMAN products that match their skin tone. IMAN Cosmetics has dedicated time and research into developing a useful and unique code that maximizes consumers’ shopping experience and eliminates the hassle of navigating an entire website while in-store. Beginning in the first quarter of 2012 QR codes will be added to IMAN Cosmetics cartons in the foundation and powder categories.